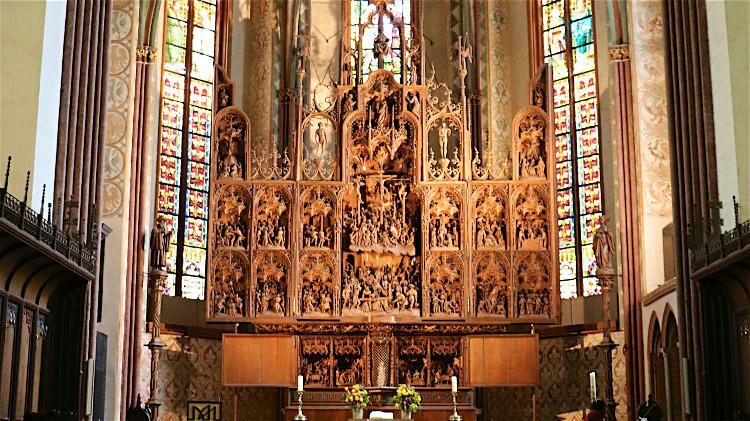 The wood carved Bordesholm Altar and marble cenotaph of Danish King Fredrick I are art highlights in the brick Gothic St Peter’s Cathedral in Schleswig. 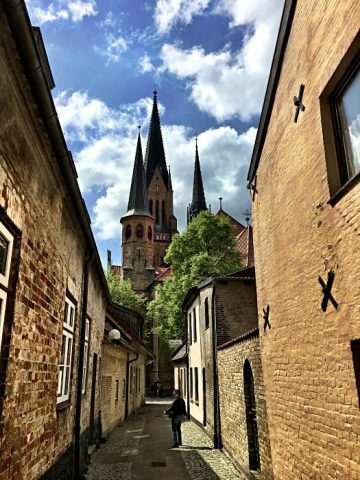 The St. Petri Dom zu Schleswig (Cathedral of St Peter at Schleswig) is one of the most important and most impressive historic buildings in Schleswig-Holstein in northern Germany. It combines Romanesque and Gothic styles and is constructed out of granite, tuff and brick. 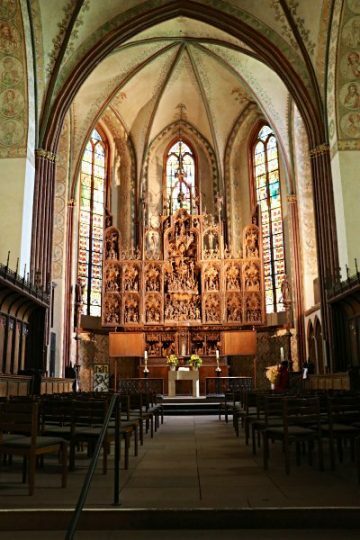 The interior is filled with art with the magnificently carved Bordesholm Altar by Hans Brüggemann the clear artistic highlight in the church. 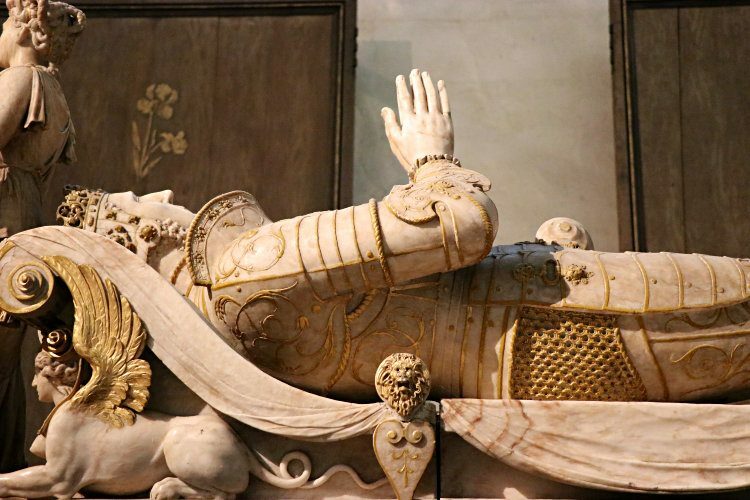 Schleswig is also the final resting place of king Frederick I of Denmark and his marble sarcophagus is one of the best examples of Dutch-Renaissance sculpture in the region. Schleswig became the seat of a bishop in 948/9 at the same time as Ribe and Aarhus on the orders of (German) Emperor Otto I in an attempt to extend his influence over the Jutland peninsula. He briefly controlled much of the region including the nearby Viking trading city of Haithabu (Hedeby) before the Danes re-conquered the land. Nothing is known of the original church but building work for the current cathedral started in the late 12th century. The oldest parts of this large church are the Romanesque nave and the portal of St Peter that are built partly from tuff transported all the way from the Rhinelands. Most of the Gothic church was built between 1200 and 1408 but the building was only fully completed hundred years later with the tower extended during the late 19th century. The magnificent tower of Schleswig Cathedral, like so many others in Germany including Cologne Cathedral and Ulm Minster, is neo-gothic from the late 19th century. Denmark lost Schleswig to Prussia in the war of 1864 and the new tower was built as much as a symbol of German rule as of a need to complete the church. At 112 m, the tower of Schleswig’s cathedral is tall out of proportion to the physical size of the church but it was supposed to impress. 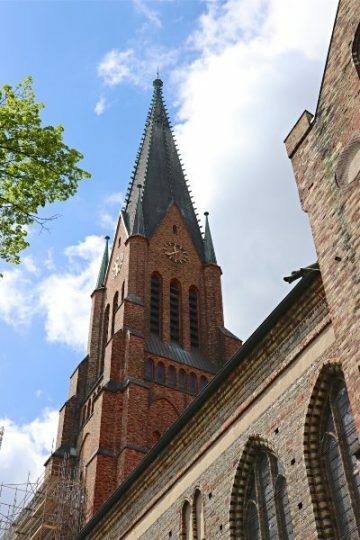 It is the second tallest church tower in Schleswig-Holstein behind only the Marienkirche in Lübeck, which at the time was not part of the state. The tower was completed in 1894 but it was a rushed job built on the cheap and repairs were already needed 13 years later. A complete renovation had to wait until after the Second World War. Pulling the tower down was briefly considered as an economic solution but by then it had developed into the symbol of Schleswig and an essential part of the city skyline. The tower, and some other parts of the church, is currently being repaired, which may influence the opening of the viewing platform around halfway up. The artistic highlight in the Schleswig Cathedral is the huge oak altar made by Hans Brüggemann between 1514 and 1521. 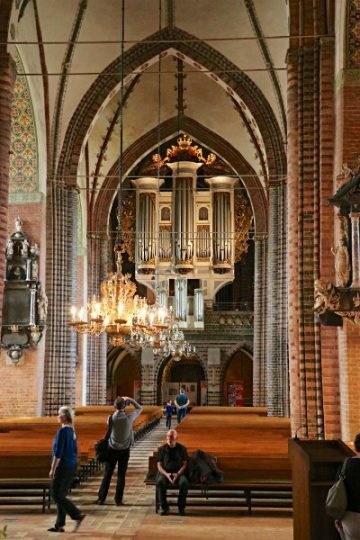 It was originally in the Stiftkirche of Bordesholm where Duke Fredrick and his wife Anna wanted to be buried. However, by the time of his death, Frederick was king of Denmark and he was buried in Schleswig Cathedral. The altar was moved to Schleswig in 1666. The altar, carved from oak, measures 12.6 m high and 7 m wide. 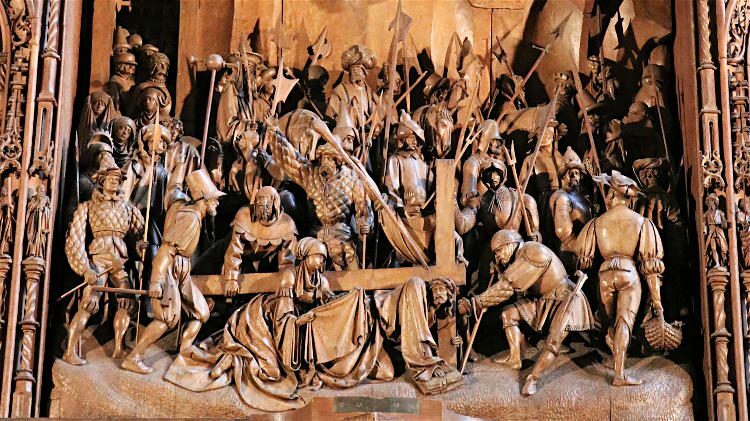 It is adorned with almost 400 carved figures and mostly depicts the passion of Christ and the ascension. Some of the scenes were clearly inspired by Albrecht Dürer’s “Kleine Passion”. Many figures are masterly carved with individual details. The church brochure, and information sheets at the altar, explains the various scenes, although visitors familiar with Christian teaching and religious art should be able to work out most of the scenes easily. Don’t miss the laminated photo album at the far end of the choir with beautiful close-up photos of some scenes and figures. 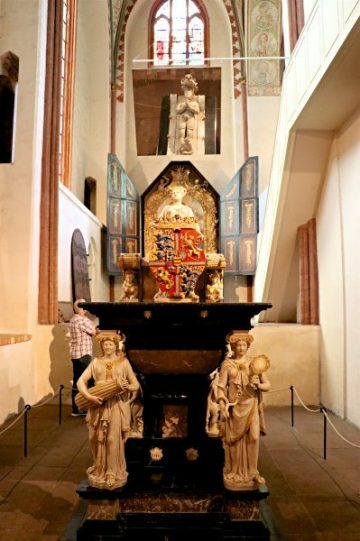 The other large artistic work in the Schleswig Cathedral is the Dutch-Renaissance marble tomb of Frederick I. The marble and alabaster cenotaph is the work of Cornelius Floris of Antwerp. It was erected in the choir in 1555 and moved to its current location in 1901. The large sarcophagus is carried by six virtues but it is empty: Frederick I was buried inside the church but the exact location of his remains is unknown. A life-size reclining figure of Frederik is on to of the sarcophagus – a mirror allows visitors to easily see the details. Frederick I of Denmark (Frederik 1 in Danish or Friedrich I. in German) was the younger son of Danish king Christian I. He was duke of Schleswig-Holstein-Gottorf (1490-1523) and king of Denmark and Norway from 1523 to 1533. He was the only Danish king ever to rule Denmark from Schleswig-Holstein and there are considerable doubts whether he could speak Danish – German was commonly used by the Danish nobility up to the 19th century. 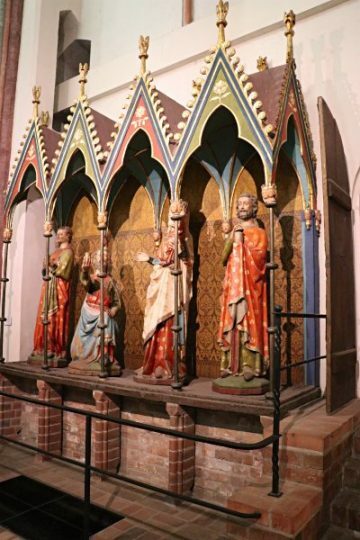 From the middle ages, life-size figures of the three kings from the late 13th century and the Group Carrying the Cross from the 15th century. The choir stalls and triumphal cross are from the early 16th century. The bronze baptismal font was donated by Laurens Leve in 1480 and is possibly the work of Hinrich Klinghe. Some elements were added during the Baroque period. Another important Dutch-Renaissance work is the pulpit donated by the canon Caseo Eminga from Gronige. The large St Christopher statue at the St Petri portal is also by Brüggeman. The main organ prospect dates from 1701 but the organ itself is by Marcussen (1963) and expanded by Karl Schuke in 2010 to 65 stops and four manuals. The entry is through the Petri-Portal on the south side. This dates from 1180 and has statues on the tympanum of Christ, Peter and Paul. A few worn lion sculptures are still outside the church but the best-preserved example is now displayed in the vestry. As a working church, it is closed for sightseeing during services and related events. The organ is often used for concerts. Free 20-minute programs are usually played on Wednesday and Saturday at noon. Longer concerts are more likely Wednesday evenings in summer – see the church website (German only) for the concert schedule (Musik or Termine / Konzerte). As with many cities that housed both a bishop and a duke, the residences of both were physically separated. While the cathedral is at the heart of the old town area, the Schloss Gottorf with magnificent gardens and fine museums are to the west of the center. The Viking trading city Hedeby was on the southern bank of the Schlei fjord where the Haithabu Viking Museum with Viking houses are dedicated to the Viking era and archaeological finds.